Zootropolis is by far the best comedy animation of the last 10 or even 20 years. It gets full marks 10/10 from both London Mums and London Kids Club. Even the Dads from our network attending the special screening showed extremely positive reactions to this wonderful film. Zootropolis is one of those movies you want to watch over and over again to spot all the little details that you would have missed at the first viewing. It is full of funny little details that are there but not on your face, therefore only visible to a careful looker such as the iPhone for rabbits which has a carrot instead of an apple on the back (iCarrot) or the iPaw which is the animal equivalent to the iPad for humans. This is exactly what makes Disney so special compared to many other film productions. Read further for my top ten reasons why I think Zootropolis is one of the best comedy animations of all times. 1) The story is like no other in the history of comedy animation let alone talking animal cartoons. The modern mammal metropolis of Zootropolis is a unique city. Comprised of habitat neighborhoods like ritzy Sahara Square and frigid Tundratown, it’s a melting pot where animals from every environment live together—a place where no matter what you are, from the biggest elephant to the smallest shrew, you can be anything. But when optimistic Officer Judy Hopps arrives, she discovers that being the first bunny on a police force of big, tough animals isn’t so easy. Determined to prove herself, she jumps at the opportunity to crack a case, even if it means partnering with a fast-talking, scam-artist fox, Nick Wilde, to solve the mystery. 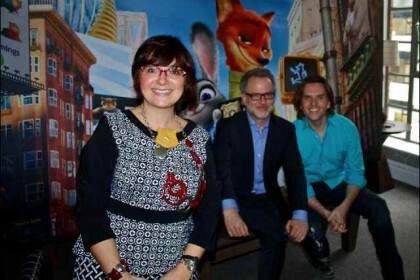 Walt Disney Animation Studios’ Zootropolis a comedy-adventure directed by Byron Howard (Tangled, Bolt) and Rich Moore (Wreck-It Ralph, The Simpsons) and co-directed by Jared Bush (Penn Zero: Part-Time Hero). 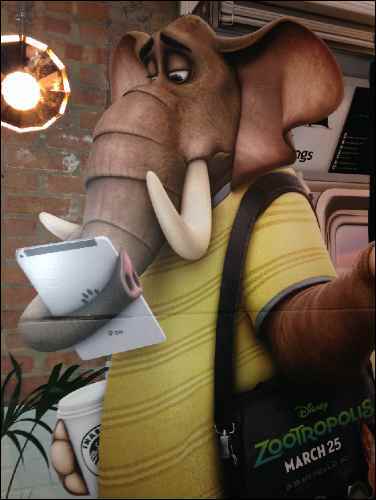 2) Zootropolis will go down in film-making history for creating some of the funniest characters of all times. 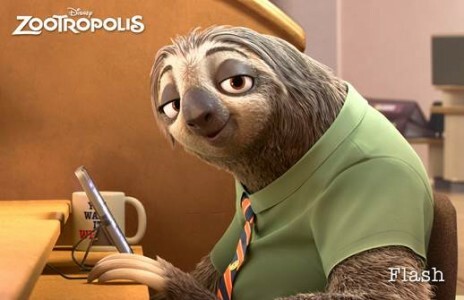 The incredibly slow sloths working behind the counters in the Department of Motor Vehicles are so hilarious that they will certainly become iconic in animation history. Making a sloth a memorable star in a film is quite remarkable in its own right. This clip of Flash (even his name is ironic) will make you wee for laugh … You have been warned! Another quirky and contemporary characters are Clawhauser, a smart phone app loving chubby cheetah who works behind the reception desk at the police precinct and a sneaky weasel who tries to outsmart Judy Hopps, during a chase through ‘Little Rodentia’. Look at these hilarious clips as tasters. 3) The amount of details to watch will make Zootropolis one of the most watched films on DVD. You will want to pause and watch it over and over again. My family and I cannot wait to see it again soon. We loved all references to modern life such as the iCarrot and iPaw, the metro doors to get all the animals in and out quickly, the juice bar where a giraffe can drink from a long straw and so on. I could make a mile-long list. Check out in this trailer how detailed the modern city is, tailored as it is to accommodate both big and small animals. 4) This film can be enjoyed by children and parents alike. Everyone is guaranteed to read it at a completely different level. Adults will enjoy spotting all references to famous movies such as The Godfather, Breaking Bad, among the most obvious ones. I won’t spoil it for you as it is part of the fun trying to figure this out. 5) The motto and underlying positive message of this film ‘Everyone can be anything’ is amazing, uplifting and very educational not just for children but for adults too. 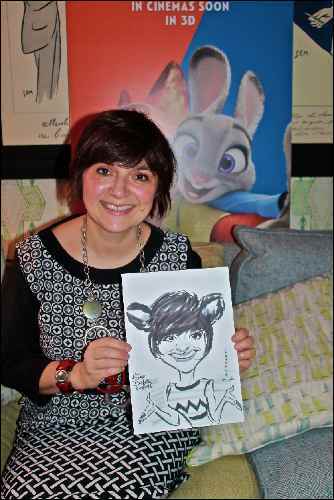 It encourages you to follow your dreams against all odds as young rabbit Judy Hoops (voiced by Ginnifer Goodwin) who pursues her dream of becoming a cop in a world where bunnies are considered dumb and sweet not tough. She finds herself faced with a number of setbacks, not least the fact she’s a tiny, furry animal. Optimistic new police officer Judy Hopps discovers at her own cost that being the first rabbit on a force of big, tough animals isn’t so easy. By accident she befriends a fast-talking, scam-artist fox, Nick Wilde (voiced by Jason Bateman) who helps her solve her first big case. Judy is so determined to prove herself that she jumps at the opportunity to crack a case, even if it means partnering with Nick to solve the mystery. Nick and Judy, lead characters in the film, lived their entire lives listening to others telling them who they should be (predator or prey) therefore they struggle against their limitations throughout the whole film and in the end they overcome that to achieve their dreams. 6) The soundtrack by Shakira is fantastic and the song Try Everything will become memorable not just for fans of Shakira. Just watch these videos. 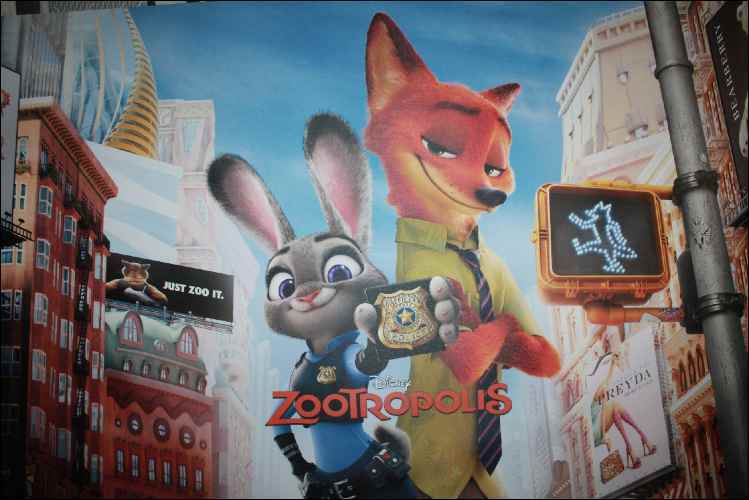 7) Zootropolis has a different name in every country. It’s called Zootopia in the States, Zootropolis in the UK, Zoomania in Germany, etc Apparently this has been done to allow the film to have a unique title that works for the different audiences and for other legalities. For other films this move could fire back against the success of the entire marketing operation but it won’t as Zootropolis (whatever you will call it) is an excellent movie and will be remembered for its funny stories and characters. So much so that I think it will mirror Frozen success also in merchandising sales. 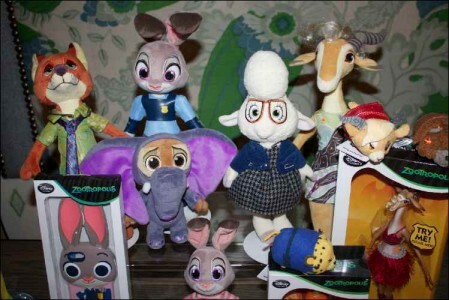 There are so many lovable stars that I can envisage lots of Zootropolis plushes, dolls and toys being sold. 8) This fantastic comedy is directed by three of the most respected film makers at Disney Animation Studios, Byron Howard (Tangled, Bolt) and Rich Moore (Wreck-It Ralph, The Simpsons) and co-directed by Jared Bush. Make sure you grab a copy of our London Mums Magazine Spring issue to read my interview with the directors. Unmissable issue out in supermarkets from 5th March 2016. 9) The idea originated with Byron Howard wanting to do a film similar to Disney’s 1970s adaptation of Robin Hood which also featured animals in anthropomorphic roles. The city was envisioned as if animals designed it rather than humans. The concept is very new and has a contemporary look and feel: Animals live in a modern world designed by animals. 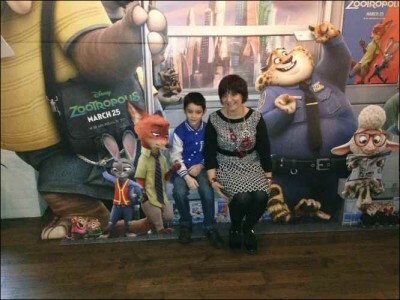 Diego and I are on our way to Zootropolis. If I was going to be a character from the film I would be like Judy Hopps, the headstrong bunny. 10) Zootropolis takes me back to the greatest Disney animated animal films I grew up with like Robin Hood (my absolute favourite), but with a funny, contemporary twist. 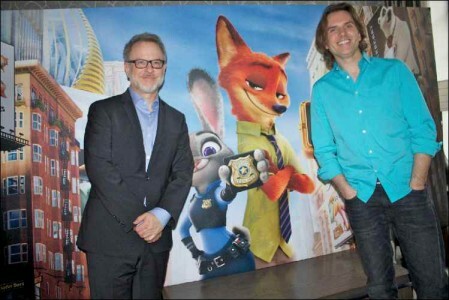 It has such universal appeal that will make Zootropolis one of the most popular animations in history. 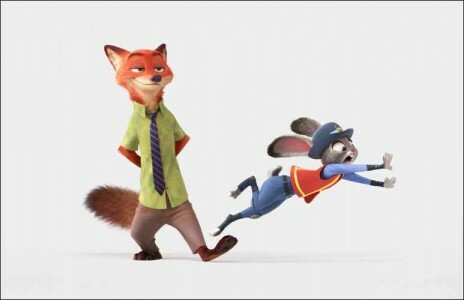 Zootropolis opens in UK cinemas on 25 March 2016. Disney will certainly hope to match the success of Frozen, which grossed more than $1.27bn at the global box office from November 2013 and Big Hero 6, which has made more than $600m since its release in November 2014. In November 2016 Disney’s Animation Studios will release a musical feature Moana, a mythic adventure set around 2,000 years ago and across a series of islands in the South Pacific. 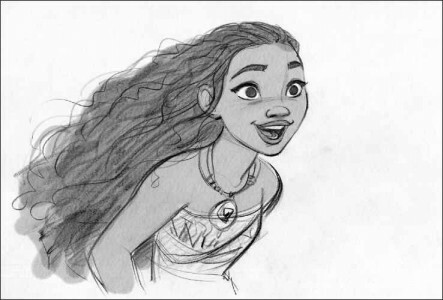 It will be centred on Moana Waialiki, a teenage sea-voyaging enthusiast and the only daughter of a chief in a long line of navigators who sets off on an epic journey to find a fabled island and teams up with demigod Maui, encountering sea creatures, underworlds and spirits taken from Polynesian mythology. From a first look it looks also very promising. This entry was posted on Friday, February 12th, 2016 at 5:05 pm and is filed under Movies. You can follow any responses to this entry through the RSS 2.0 feed. Both comments and pings are currently closed.